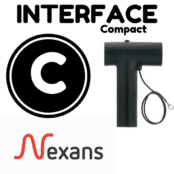 Nexans Euromold 484TB bolted tee elbow connectors are used to terminate MV-HV XLPE/EPR (polymeric) insulated cables up to 42kV into 400 Series Interface C Bushings with M16 bolted connections on the medium/high voltage switchgear, transformer or electrical equipment. To select the correct Euromold 484TB connector for termination of MV HV power cables with copper wire screen or tape screen to Interface C bushings (630 Amp | 1250 Amp) full cable specification with dimensional information is required – see the Euromold 484TB download opposite for complete technical specification of the elbow connector. See the installation instructions for Euromold 484TB separable elbow connectors Type C Interface – the document covers (K) (M) (P) 484TB/G connectors including 33kV/36kV Interface C switchgear/transformer connections up to 42kV. The Euromold 484TB tee connector with 630A – 1250A current rating is designed for Interface C and covers voltages from 12kV to 42kV with a maximum conductor size of 630sqmm. Euromold 484TB plug-in tee connectors can be supplied as a straight connector (450SR) or a coupling connector (800PB, 804PB or 809PB) and with surge arresters (800SA or 300SA) – all suitable for use with Interface C Compact type bushings on SF6 gas-insulated switchgear. Euromold 484TB separable tee connectors are designed to connect all polymeric screened cables to suit CENELEC Interface Type C (630-1250amp) equipment bushings with M16 bolted connection up to 24kV. 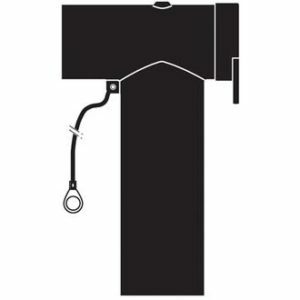 484TB tee connector can also be used to connect cables together using the appropriate mating part and parallel “piggy-back” connectors are also available to enable multiple connections to a single bushing. 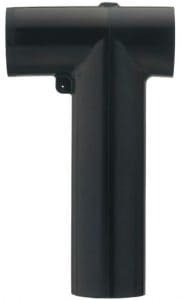 484TB connectors are suitable for terminating MV-HV cables with either “easy-peel” or bonded semicon screens – the 400 Series elbow connectors are specified for indoor cable termination applications, apply suffix (MWS) for outdoor cable connections where additional water-sealing and blocking mastic is required. Type C – interface as described by CENELEC EN 50180 and 50181. Select the Euromold 484TB the ordering part number which gives you the best centring of your core insulation diameter and substitute X using table X, according to the conductor size (sqmm) and type (copper or aluminium). 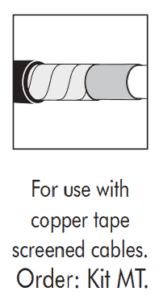 Order Euromold MT connector kit to enable termination of copper tape screened MV-HV cables in voltage range 11kV (12kV) to 42kV – suitable for copper wire screened cables. 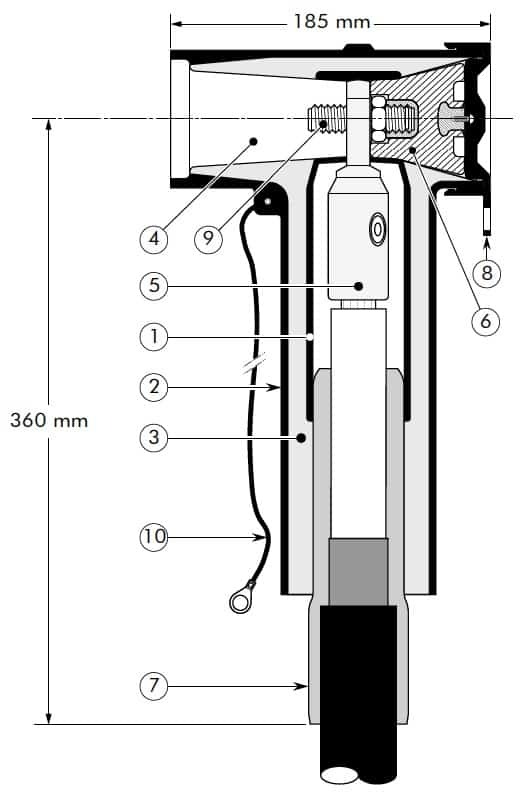 The complete Euromold 484TB tee connector kit comprises the following components – cable lubricant, field control mastic, gloves, roll adhesive tape, installation instructions and crimp chart. Provide complete manufacturers cable specification and actual bushing interface type to ensure compatibility of the Euromold connector with the medium/high voltage cable, switchgear or electrical equipment. Specification and design of the Euromold 484TB separable bolted tee connectors are available as a download opposite. The connector and Interface C bushing should be cleaned and lightly lubricated before pushing the 484TB connector onto the bushing. Clean and lubricate the insulating plug for the opposite side of the 484TB connector. 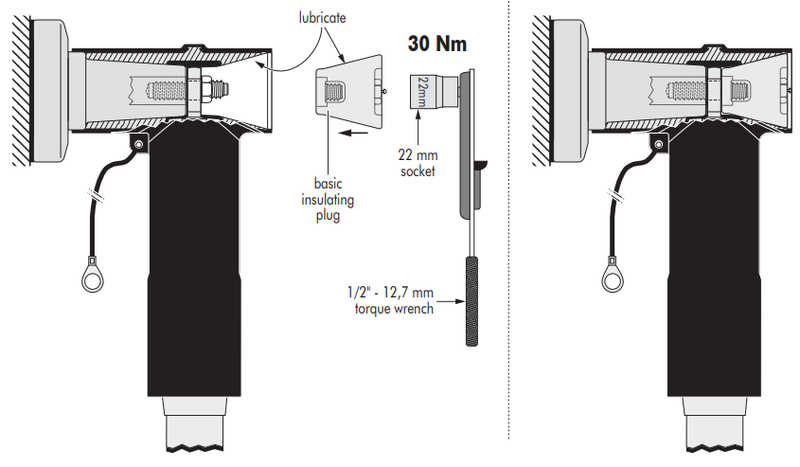 Insert the plug in the connector and tighten assembly – use torque wrench with socket of 22 and tighten exerting 30 Nm (3 kgm or 22,1 foot-pounds) of torque. 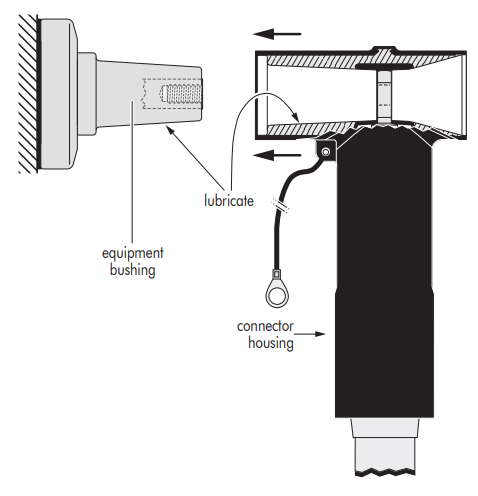 In order to achieve the correct applied torque to the separable connector ensure that there is no lubricant on the threaded parts.